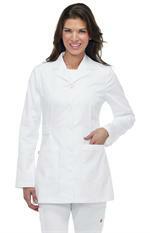 This 37" professional lab coat features a classic notched lapel collar with three outside patch pockets and one inside pocket. Front and back princess seams create a flattering and slimming look. Made of Cotton/Poly Poplin.